← What Held Christ to the Cross? 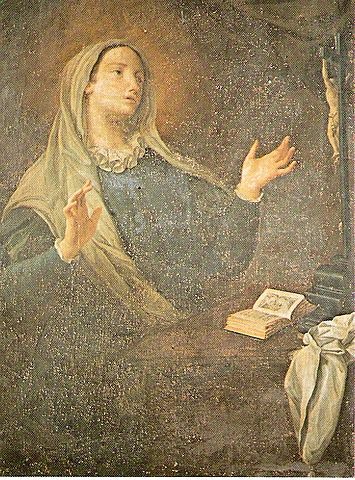 St. Catherine of Genoa was a mystic who influenced Saints John of the Cross, Francis de Sales, and Vincent de Paul. She also influenced the French Oratorian and Carmelite movements. Near the end of her life St. Catherine wrote a treatise entitled On Purgation and Purgatory. In her treatise St. Catherine explains how Purgatory is an expression of God’s love for us and our love of God. It is through love of God that a soul chooses Purgatory. The soul desires to be purged of all the vestiges of sin that remain after death before approaching the throne of God to dwell in His presence and love. Purgatory is where God, in all His mercy, removes all that hinders a soul from dwelling in His presence. As the vestiges of sin are purged from the soul, that which hinders the loving embrace of God are removed. It is through the soul’s desire to be intimately received by God that the soul joyfully submits to the purgation of Purgatory. It is through God’s love and mercy that a soul is purified and refined in Purgatory so that it may dwell with God forever. This entry was posted in Essays, Uncategorized and tagged Catholic, Catholicism, Christian., Christianity, death, purgation, Purgatory, sin, St. Catherine of Genoa. Bookmark the permalink.